Well, it's down to the last day in January, and I figure I better post at least one entry before the month slips by entirely. So what's up with the deafening silence you ask? Well, it's been an interesting month. "Interesting" being the traditional ambiguous euphemism that parents and optimists use for both good and, well, "not-so-good". First, let's dispatch with the "not-so-good". Early in January, I came across a WSJ article featuring a site with significant similarities to some of the core capabilities of FamZoo. (I'm not going to mention the name because I'd really like to stay off their radar for now and smart companies regularly conduct Web searches on themselves.) Finding a direct competitor was quite disappointing. Until that article, I had not seen anything deployed on the Web that came close to what I am building, and I was relishing the idea of being the first company to launch in the space. Now I am kicking myself for taking so long to get the gumption to start a company around the idea that I originally implemented for my family back in 2002. Sigh. But, as I always like to say: "Get over it". Aside from the usual platitudes in this situation ("It validates the market", "Google wasn't first either", etc. ), there have been a number of positive side effects. My focus and sense of urgency have increased substantially. Seeing a competitive offering and being able to study their strengths, weaknesses, biases, etc. 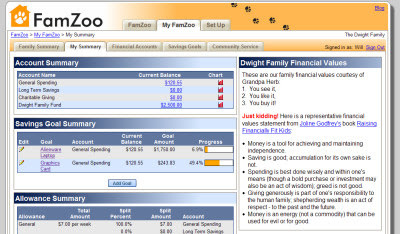 has forced me to think more deeply about what to emphasize in FamZoo and what will set our offering apart from this initial competitor as well as, ultimately, many others. Being first to market will just no longer be one of those points of differentiation, which is OK because that is more a matter of personal pride than a compelling reason to flock to (and remain with) the service. So, what have I been up to in January? User interface and user interaction design. Having a great user experience will be crucial to my success, so this area deserves a lot of attention and iteration. To date, my family has been very prolific and helpful with their feedback, and my to-do list remains well stocked. So, I will not be widening the alpha test audience just yet. This allows me to iterate most rapidly with virtually zero customer support or production deployment overhead while still getting very real and actionable feedback. It is also helpful that my family spans all relevant age ranges and has zero hesitancy when it comes to (predominantly ;-) constructive criticism. I figure low burn rate, high productivity, and plenty of honest feedback makes a good combination. Here's a little peek at how the user interface is progressing. 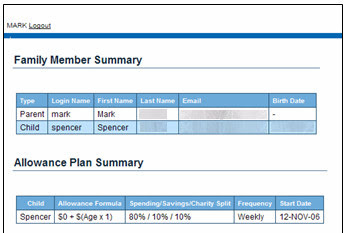 It is still early with lots of fit-and-finish work to go, but the contrast between the January 2007 user interface and the November 2006 predecessor should be readily apparent even with the intentionally low resolution screenshots provided below. It's been very enlightening to learn firsthand and in depth about all of the intricacies of getting a modern Web user interface to behave consistently and effectively across the popular browsers. Dealing with issues ranging from blatant browser incompatibilities like this famous one to separation of presentation and semantic content to supporting liquid layout (vs fixed width - yechh) to honoring the user's browser font settings to reliably implementing rounded corners and tabs (should be simple right? not...) to leveraging some of the emerging rich Web UI libraries makes user interface work an interesting combination of technical and creative challenges. Subtle, seemingly small technical decisions can have very large user experience and business impact here. Just the kind of multi-disciplinary challenge I like. Time to get back to coding. Oh yeah, and a happy belated New Year to you all. Hey, great to see the new posting! (You do have a following out there.) I have no idea how you know how to make a program that interfaces with all those modern web browsers out there, but I can appreciate how the small decisions now can greatly impact the functionality of the program later (there's an interesting parallel to architecture in that). Looking forward to seeing the latest at the next chalupa night! You managed to stay off the radar for a good bit of time but to your point, a good company spends a lot of time researching and I ran across you tonight. I'm the CEO of PAYjr - drop me a note if you like and we can talk. I like what you are doing and wish you all the luck in the world.